How do I use my heating? When you come to Korea, you can say goodbye to the word radiator and say hello to Ondol. Ondol is an underfloor heating system that has been used in Korea for centuries. Since many Koreans still sleep and sit on the floor, it’s extremely useful in the cold weather. In fact, most winters there’s nothing I love more than throwing my duvet on the floor, turning on the ondol and having a little nap. The first picture us much more common than the second. The second is a lot older than the first but if you look carefully, you’ll see the same words on both. Let’s take a look at some now. 2. 온수온도 and then 고, 중, 저. This means water temperature, high, medium, low. 3. The wheel says 외출/온수전용. This means the temperature you want to set it to if you go out. Turn it up or down etc. 4. 난방선택 and then 온돌, 실내, 예약.난방선택 is heating choice. 온돌 is the floor heating, i.e. it heats the floor but not so much the water. 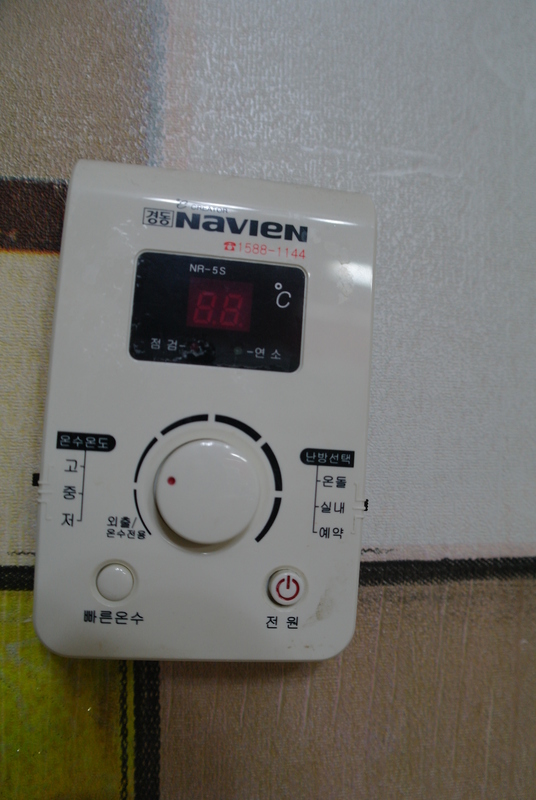 실내 means indoors or interior and in my apartment it heats the water and the floor. 예약 means reservation. You can set the heat to come on at a certain time but this has never worked for me so I wouldn’t know. My tip is to leave your heating on continuously low during the real winter, especially if you go on Christmas holidays. If the pipes freeze and burst, the whole floor has to be taken up and it’s an expensive job. Leave the heating to 10 or 15 degrees. The heating only comes on if the temperature goes below that point so it’s not like it’ll be on the entire time. I hope this helps someone somewhere! Apologies if my Korean spelling or explanation is useless, as it turns out, I’m foreign. Feel free to correct any mistakes below! 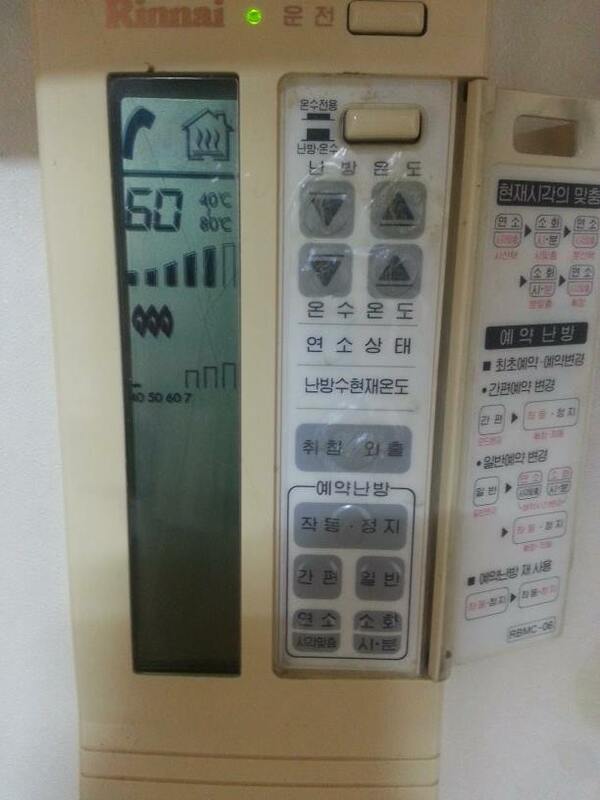 Posted on November 10, 2013 by Wild Atlantic Shauna	• This entry was posted in Life, Paju, South Korea and tagged explanation, 고, 빠른온수, heating, 실내, 예약, 온돌, 온수온도, 저, 중, Korea, ondol, system, underfloor, work. Bookmark the permalink.